This summer’s bug problem is going to be bad, and with a huge population of nasty bugs, you’re going to need a good pest control company to keep them away. With so many pest control companies to choose from, picking the right pest control company can be tricky. Some pest control companies just treat with a backpack sprayer, and that will not get the job done. Power-spraying the home’s foundation is the only way to properly treat it for pests. What a power-spray treatment will do, is place a heavy amount of product around the foundation of your home. The pressure coming out of the hose will help penetrate or push the product under the rocks, and soil around the home; where most bugs will live. Select a company that offers a power spray service. With an outside treatment, a power spray will put a barrier around your home, but won’t kill the pests at the source. The main source of the pest problem will be at the base of the plants and trees. This is where pests will get food and water to survive. Properly granulating these areas will effectively control the pests from infesting your home. Look for a pest control company that treats pest with granules. On the inside of the home, a lot of pests will infest inside the walls. If the pests do get inside the walls, an infestation will occur; and if not properly treated the infestation will only grow. A company that does an in-wall treatment will place a product directly inside the walls of the home. This is done by taking the face plates of the outlets, and dusting inside the walls. This will help kill any of the pests trying to infest inside the walls. Checking to see how well a pest control company rates among other competitors is a good way to see how customers view the company’s service. The best way to do this is check online. Good places to look for customer reviews include: Google, Yelp, Better Business Bureau, and Family Owned Pest Control. 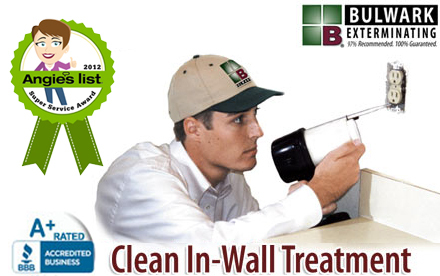 If you want a pest control company that uses a power spray treatment, treats with granules, offers an in-wall treatment, and has awesome online reviews; look no further then Bulwark Exterminating! Thanks for the information. I’ve been having a really big problem with a pest infestation. I’d like to get rid of them, but I haven’t been sure about what to do. I’m going to follow your tip about making sure I find the right pest control company. It’ll be one that arrives on time, is dependable, etc. Do you have any other tips? These are some great tips, and I appreciate your advice to choose a pest control company that offers a power spray service. My husband and I just moved into a new house, and we’ve been having some problems with bugs. We want to get that taken care of, so we’ll definitely look into hiring a professional service that offers a power spray service. Thanks for the great post! I’ve been looking for a pest control company to come and work on my home, and I think that your article is going to help me find the best company for the job! In your article you mention that I should look for a company that not only sprays around my yard with a backpack sprayer, but one that uses a power spraying machine. I had no idea that pest control companies even did this! I’m going to ask each company if they offer this service before deciding to hire them. Thank you for the information! I liked your tip about finding a company who will use a power sprayer treatment. I didn’t know that a simple backpack sprayer wouldn’t get the job done. Next time I have to find a pest control professional I’ll have to find someone who uses only the best and most effective treatments. I didn’t know that pest control services can get into the walls of your house. This would be good for getting rid of tricky bugs or mice. There have been a few people in my neighborhood who have mentioned seeing mice around, so I’ll have to keep an eye out. If I see any, I’m going to call for pest control right away. I thought that you made a good point about asking if a pest control company will do in wall treatment. I’ve heard of a few different pests that can infest my walls and eventually my entire home. I wouldn’t want that to happen, so asking for in wall treatment will probably help to ward away bugs from my house. Thanks for the tips! Selecting a good pest control company is major task before taking service. Here tips which you shared with us are very good and useful. Getting most effective pest management service is very necessary when we get frustrated by pests. I think it’s a little unsettling that a lot of pests will infest inside the walls. I had a friend who had to hire a pest control company to come to his house and get rid of a few mice. If I ever need a company, I will be sure that they will check inside of the walls. Thanks for the informatoon. I had no idea that power-spraying was important when wanting to treat pests properly on the homes foundation. I have been noticing a lot of unwanted pests and am wanting to hire a pest control company. I will definitely look into making sure they provide power-spraying for the foundation. Thanks for the information! I appreciate your tip on finding out how reliable a pest control company is by checking online reviews. I would imagine that the internet could offer a lot of helpful reviews for different companies. My husband and I need a pest control company to help us take care of a mouse infestation so we’ll have to be sure to find someone with plenty of positive reviews. Loved this article. I’m actually in the market for a pest control specialist now. I just bought a new home and i keep getting little crittters inside my house. Most of these critters are spiders, lizards, and grasshoppers. If anyone can help me with this issue I would greatly appreciate it. Keep up the posting of this great content. We just moved into a new home that has some issues with mice and some bugs. I think we will need some professional help to make any permanent solution. As you said, a good pest control company with use these different methods to really ensure lasting results. I didn’t realize that in wall treatment was so essential to avoid infestation. Also looking at experience can help ensure quality service. I like that you talked about how you should look at the reviews of the company. I would have never thought to look at the Better Business Bureau website to check if a pest control company is good. I would personally want to know if they do a good job with rodents in crawl spaces. That sounds like a hard place to get to and get rid of the mice. I think the article makes a good point that reviews can be helpful when choosing a pest control company. I personally think the best reviews could come from word-of-mouth recommendations from family or friends. If I wanted to find a company that could get rid of my pest problem, I’d be more willing to trust them if they’ve been vouched for by a trusted friend. We are a little concerned that our house may have termites in the walls. and would like to hire an exterminator. The problem is that this is the first time we have ever had to hire one, and we need help choosing the right one. I like how you suggested that we find a company that might offer in-wall treatment, this will make me feel better knowing that the treatment is done both inside and out. Thanks for the different insight in what we should look for. This is some really good information about pest control. I really hate the bugs and I wouldn’t want them in my home. Your advice is about how bugs can live in walls and that you need to get your walls treated to fill them is smart. It does seem like doing that will help me keep bugs out of my home.